On September 3,Calvin Coolidge, the President of the United States, issued a proclamation that "The American Red Cross will do its utmost to assist in the relief for Japan's earthquake disaster." A flotilla of U.S. Naval ships entered the port of Yokohama on September 5 to offer disaster relief support.The U.S. also loaded food supplies, on a warship based in Manila which arrived in Yokohama on September 7. Other ships carrying relief supplies, Army doctors and Red Cross employees were on their way to the port. The American Red Cross, which asked U.S. citizens to donate US$5 million for a Japanese disaster relief fund, reported that large amounts of money had already been collected. Cinemas and theatres around the U.S. were cooperating in the fund raising effort. The New York Salvation Army, which learned that the officer in charge of the Japanese Salvation Army was a victim of the earthquake and that the Salvation Army building had been destroyed,immediately called for donations totaling US$5 million for the people of Tokyo. According to a White House announcement,President Coolidge mobilized the services of various U.S. government organizations to aid in the relief efforts.He also ordered American ships in the Far East to participate in the disaster relief and to cooperate with the relief services. Disaster relief donations collected by the mayor of London reached 30,000 pounds. Pledges Emergency relief from Australian Government. Following the Japanese earthquake, the Australian government decided to donate 10,000 pounds in emergency relief and sent a ship carrying 50'000 pounds of supplies. Governor-general Foster issued the following statement,"I believe that the Australian people will take every measure to help this friendly nation that has encountered such a horrific tragedy. The government will collect relief funds for Japan and I have faith that the Australian people will respond to this quickly from the standpoint of humanity." The Governor-general of India called for donations for the Japanese disaster victims. The Governor himself donated 5'000 rupees to the fund. A relief organization was formed with the backing of the Governorgeneral of Hong Kong. To aid the disaster victims, the Emperor Hsuan Tung donated 10,000 yuan in cash,a pearl necklace cherished by Xi-Tau-Hou worth approximately 100,000 yuan, and treasures from the Ching Dynasty worth tens of thousands of yuan. The Chinese people and foreigners residing in China were very sympathetic to the plight of the people suffering from the Japanese earthquake. The Shanghai Chamber of Commerce decided to send money, flour and rice to Japan. The Chinese Red Cross dispatched 32 doctors and nurses and other Chinese organizations were collecting donations. Following the Great Tokyo Earthquake, Zhang Zuo-lin donated 2,000 cows and 20,000 bags of flour to Japan. Two representatives from Zhang Zuo-lin traveled to Tokyo to visit the Japanese disaster victims and Chinese military personnel helping at the scene. A wagonload of flour was sent from the government and the people of Shang-chun,China. 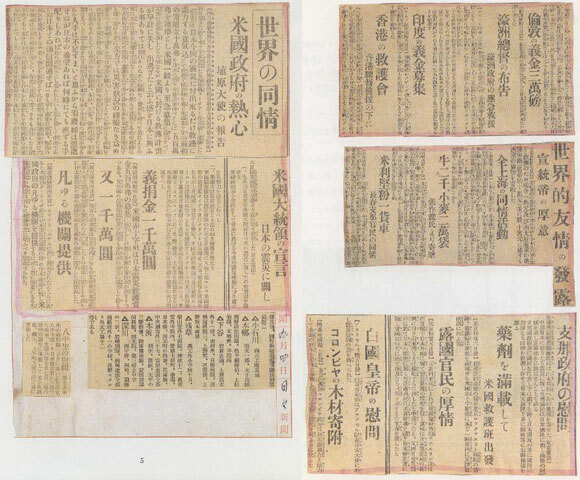 The Chinese foreign Minister sent the following telegram to Prime Minister Yamamoto:"The people of China are deeply sympathetic to the Japanese people regarding the resent Great Tokyo Earthquake and pray for as early a recovery from the disaster as possible. As the representative of the Chinese national government and its people, I would like to express my sincere sympathies to your government and people and would be grateful if you would communicate my feelings to the Emperor and the Imperial family." U.S. relief team heading for Japan with medical supplies, doctors and nurses from the Beijing Rockefeller Hospital left Tianjin for Yokohama on a ship full of medical suppliesq for the earthquake victims. The foreign minister of Russia sent Japan a telegram saying that its government had decided to provide the maximum possible aid to the Japanese disaster victims. The Emperor of Brussels communicated his sympathy and intention to send disaster relief supplies to the Japanese Ambassador. The government of British Columbia in Canada, decided to donate large amounts of wood supplies to support the Japanese recovery efforts.